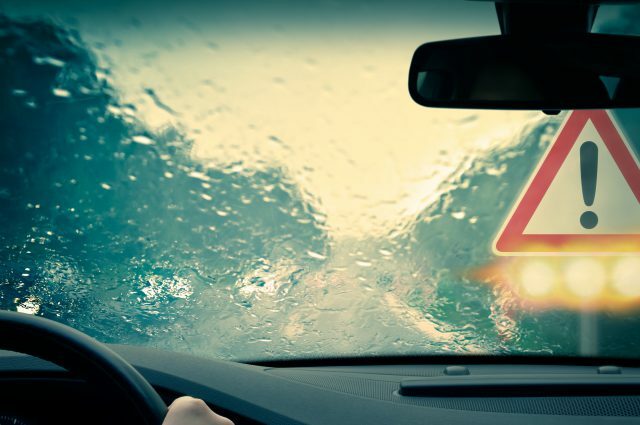 With autumn here and the first named storms already rolling in, the first in our #BeSafe series on road safety looks at how to drive safely in heavy rain. Before you set out into the worst the Great British weather can throw at you, read these tips to make sure you’re familiar with the ins and outs of driving in a downpour. If your journey is unavoidable, do a bit of planning before you set out. Calculate how long your journey should take in normal conditions and allow extra time, as well as planning a route that avoids known flooding hotspots. Make sure you have plenty of fuel for your journey; if you end up sitting in traffic due to the conditions, your car will eat through petrol quicker than you expect. Give your car the once over and make sure your front and rear windscreen wipers are in good working order. Also, take a look at your tyres and make sure the treads are deep enough — the legal minimum is 1.6mm. Treads serve the purpose of distributing the water to reduce the amount of water between the tyre and road surface, increasing grip on the road, so they’re particularly important in wet weather. In fact, each tyre can shift one gallon of water every second, so it’s vital that your tyres aren’t worn. A wet road surface increases your stopping distance – according to the Highway Code, it doubles it – while the spray from the cars ahead of you can greatly reduce your visibility, particularly in fast-moving motorway traffic. To drive safely in these conditions, you’ll need to keep more of a gap between you and the car in front. Make sure your headlights are switched on so that other cars can see you, but don’t be tempted to use your rear fog lights: they can dazzle the driver behind you, as well as being confused with your brake lights. Driving too quickly on wet roads puts you at risk of aquaplaning, where your tyres lose contact and your steering becomes light. If this happens, don’t brake or make any sudden movements. To drive safely, slow down by taking your foot off the accelerator until the steering becomes normal again. For this reason, it’s advisable to drive more slowly on wet roads (in France, the speed limit is officially lower in wet weather). Flash floods are a potential hazard during heavy bouts of rain. With just six inches of running water being enough to move a car, exercise extreme caution if you need to drive through water. Don’t drive through it if you’re not sure of its depth, and if you do, select a low gear and keep the revs high. Keep driving at a steady speed; this helps keep the water from flooding into your car, but don’t forget that there may also be obstacles such as potholes concealed by the water, which could damage your car. Once you’re safely out of the other side, gently test the brakes and pause to allow any water to flow back out. Finally, be considerate of pedestrians and cyclists when you’re driving through built-up areas; one puddle is enough to soak someone to the skin!